Mechanic in San Diego area? I'm not sure what the markup from John Hine mazda off of 8 and mission valley is. However I remember buying stuff from then for the FD.. That was YEARS ago but I don't remember flinching at the prices then. What is a good place for online parts? I'm currently using MAZDASPEED MOTORSPORTS DEVELOPMENT - Home Page since it's mainly a track car. Discounts through that program are decent enough. I've been using Online Mazda Parts for years. 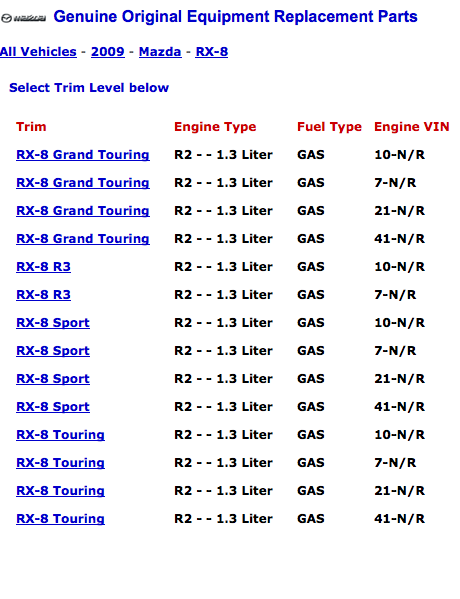 I know you asked for local but it's tough to find decent prices at dealerships unless you have a relationship with the parts department reps.
What is the difference between 7-N/R and 10-N/R? I can assume those are both manual and 21-N/R and 41-N/R are both automatics. good question ^ I have a question about that online parts list too. Is a Shinka considered grand touring? speed: that's a good question, I hadn't looked up any Series II parts in a while so I wasn't aware it gave that odd breakdown. My husband has been complaining about my "special" car. Everything (parts, service) is expensive and not easy to find. (Even good experienced mechanics are hard to find!) We tried to buy parts online as the prices are much cheaper than what car shops charge us! Special car? The Rx8 is cheap! If you need a good mechanic please go to midnight oil motors. While Jim is nice he learned from them. "Those things are the worst Mazdas ever put out"
"It's only a matter of time before your engine blows"
"Rotaries always have something wrong with them"
"Don't you have to add oil like every time you gas up?" while their answers may have a hint of opinion attached, the answers also have a hint of truth buried in them. but i disagree about the experience aspect, this forum has more members that know the internals of the rotary engine quite well compared to the average dealership whom usually has no one experienced on the inner workings of the engines. watching a training video at the mazda school doesn't count either. Last edited by Karack; 04-01-2014 at 06:30 PM. Since this tread is getting a bit old, I wanted to update it with a +1 for Jim’s Rotary Shop (619) 402-8147. I’ve had my 8 serviced at the dealership, John Hine, since new. Dealer recently recommended I do a compression test before I spend money on sparks/coils. Compression test came back as fail (rear) and almost fail (front) and dealer said the only remedy they could do was replacing the engine. I agonized for a few days over whether to replace the spark plugs and coils to get some more life out of my failing engine. Eventually I had the dealer replace the spark plugs and coils (I asked about replacing spark plug wires, but the dealer first advised that there are no wires to replace and later advised that the wires were in good condition). I looked at the San Diego area mechanic recommendations on this thread and made an appointment with Jim Hrmoda for another compression test. Although compression was not perfect, the numbers were ok (far from failing, and good for 90,000 miles on the original engine). He also found that the dealership reversed the plugs (installed the trailing on the leading and vice-versa), and that the spark plug wires needed replacing. Jim seems extremely knowledgeable about all things rotary, he has or can get parts, and he rebuilds rotaries himself. I recommend him for all service and repair. Find More Posts by Zoom!Zoom!Zoom! 2005 RX8 engine core in San Diego, free to good home. Quick Reply: Mechanic in San Diego area?